Model of the basic bastion for an earthen fort. Cannon emplacements have been added. To give a sense of scale, one of the emplacements has a cannon with a crew member there, and that dark object near the top of the image is a wagon drawn by a team of two horses. From their extended vantage point, defenders could view any and every part in front of and around the artillery fort – and spot sooner than before any sneak attack. Defenders could comfortably take a clear shot at any would-be attacker. Straight sides along the two straight faces of a properly designed bastion eliminated any blind spots. 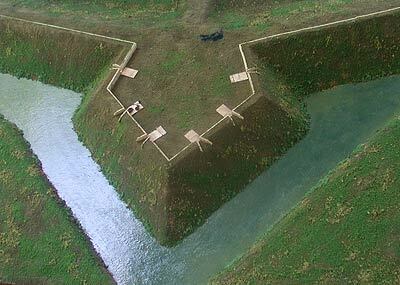 If any soldier approached the ditch, stood in front of the ditch, tried to cross the ditch, or scrambled up a rampart, he could be put in the grave by defensive fire from the bastions. As static flanks for defenders, bastions could extend farther out than towers. Like comparing ramparts to curtain walls, bastions were thick and squat compared to castle towers. They couldn’t fall down and were built broad enough to hold many defenders. The elegant tower could not match the chunky bastion for resilience against cannon and the increased size of besieging armies – Caliban succeeded Arial on the stage of war. These were the days when some artists extended their talents into architecture. A functional and hard-to-ignore architectural project was that of the artillery fort. It piqued the interest of some artists in Italy.